Preparing to survive a typical day of being Digbys friend wasn't that different from preparing to survive the apocalypse. 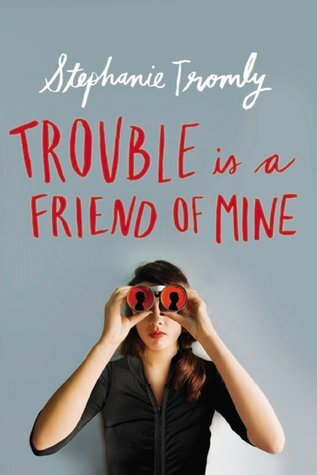 A mystery where catching the crook isn't the only hook, a romance where the leading man is decidedly unromantic, a story about friendship where they aren't even sure they like each other—Trouble is a Friend of Mine is a YA debut you won’t soon forget. The best way to describe this YA novel is cute and quirky. Filled with fun dialogue between a girl who moves to a new town, a new school, and runs into an unusual teen boy who is always up to no good as he's trying to solve the town's crimes. There are other teens, all different personalities - the good guy next door; the stuck up rich girl no one likes; the nerdy, small for his age boy who's a genius; the mom who tries to reclaim her daughter's affections; the distant and controlling dad the main character wants to please; the annoying stepmother; the weird neighbors; the annoying school security guard. Well, we get the drift some of these characters are cliche, but you know what? It works, and it works well. It's impossible to grow bored long as there's always something going on. These two don't sit still as they find their ways into trouble, get out with funny finesse, only to jump back into the fire all over again. The mystery isn't terribly strong but the book is a mixture of different genres - YA, humor, mystery, crime, a tiny bit of romance (possibly but not really). Overall it's a fun story, not a serious one. There's serious elements, of course, but it's all treated in a fun manner. Tromly's debut novel is written well - she makes convincing dialogue stream from the character's mouths and there was some humor that was funny enough to make me snicker aloud. Even if the story has some trademark characters, the story is in no way average, and the way it plays out is unique enough to stand out be remembered as something special. Why the 3 rating? I typically don't enjoy stories so quirky enough to give a higher rating, just a personal thing, but it's a great book for this type of humor genre, the author approaches it enthusiastically and the characters are easy to love.